Welcome to the first few months of parenthood, where you’ll be up in the wee hours of the morning for feedings. 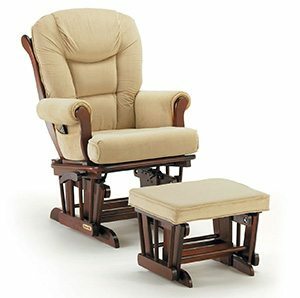 It can really start to wear on you after a while, but you can make things a little more comfortable by getting a rocker or glider chair to sit in while you feed. Believe me, you really appreciate them once you use them a few times. 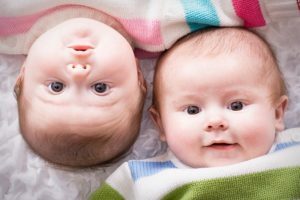 You can always feed in your own bed, but after you do it for a while you’re really going to wish you could just sit in the nursery comfortably and feed. 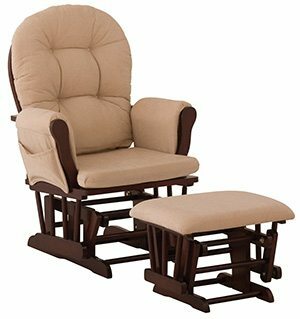 While a regular sofa chair can work, most babies find comfort in the motion provided by a rocker glider. While wooden rocking chairs have been around for a long time, only recently have gliders come into favor with parents. And for good reason; they’re way more comfortable because of the upholstery and padding compared to a wooden chair. Plus, the motion provided by a rocker glider is much more gentle and soothing to babies. The real bonus is that you can move the chair to your living room after your feeding days are over; most of them are really nice to look at, and wouldn’t be at all out of place. Here are some things you should look for in a glider. Arm rests: In my opinion, any good glider chair should have arm rests. Since you’ll be holding your baby while you use it, it really starts to wear on your arms and elbows, so good arm rests make all the difference in the world. Believe me, you’re going to regret it forever if you get a glider without arm rests. High back: Don’t get a glider that doesn’t have a high back to rest your head on. It really makes a big difference, and you’re going to end up with a really sore back and neck if you don’t have one. The least-expensive option on our list, the Stork Craft Hoop Glider (click here to see it in 5 different colors) is a nice little glider chair that will work well in most nurseries. There is a version with an ottoman, which I would recommend personally, but you can save a little bit of money if you go without one. Unlike some gliders, it doesn’t recline very far, but it’s still very comfortable. The arm rests have pockets that you can use to store things like TV remotes or magazines, which is nice. It’s also a nice-looking chair, so it will fit well in any nursery, or even the living room afterward. All in all, this isn’t the best glider, but as a budget option, it does the job. 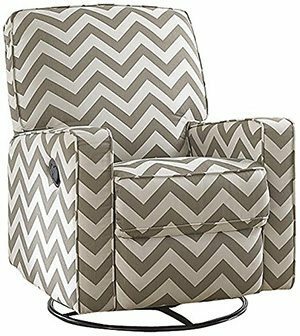 This nice-looking glider (click here to check price on Amazon) has padded arms (which I love) and a matching ottoman that also glides. All of the cushioning is removable, and that includes the arms. It’s really comfortable even if you have to sit in it for long periods of time, especially if you have a bad back. The rocker can lock into a total of 6 different positions depending on what you prefer, from upright to inclined. For feeding purposes, you’ll probably want to have it in one of the first few upright positions. The real bonus of this chair is the ottoman. Not all gliders come with one, and it really makes a huge difference in how comfortable it is to be able to have your feet elevated. Overall, this is a really nice glider that doesn’t cost much. 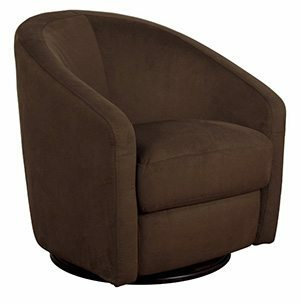 A step up from the Shermag, the Dutailier glider (click here to see it in 4 different colors) is an excellent glider chair and ottoman combo. There are several models and variations of Dutailier chairs, and all of them are pretty nice. It’s really easy to assemble and only takes 10-15 minutes. Like Shermag, they have 6 different reclining positions to make it as comfortable as possible for you, and the ottoman just adds to the comfort. 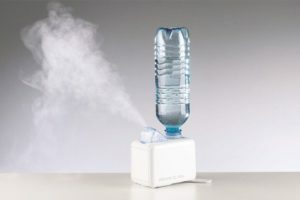 You aren’t going to want to use it without it! The cushions are all removable to make them easy to clean, too. The high back is really supportive and feels great on the back and neck, especially for late-night feedings. While this isn’t a cheap glider, it’s really great and I’d highly recommend it! A different design from the others on the list, the Pulaski Sutton (click here to see it in 3 different colors) looks and feels like a sofa chair that functions as a glider! It’s really comfortable to sit in for extended periods of time, and has a recliner to rest your feet on. If you happen to fall asleep in the chair, the reclining footrest will stay locked in place. The chair reclines to about a 45 degree position, but just remember that you can’t glide with it in a reclined position. 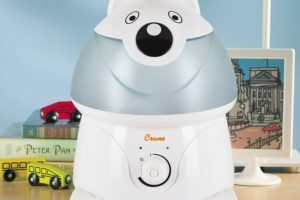 The material used on the outside is microfiber, and it’s really easy to clean if need be. What’s really nice about this chair is that it swivels, so you can place it wherever you want and face different directions. It seems like it’s big for a small room, but it really isn’t, and you don’t have to have it very far away from a wall in order to be able to recline with it. Since it’s basically a sofa chair, it fits in well in any other room once you’re done using it in the nursery. A nice bonus! Rounding out the list is the babyletto Madison Swivel Glider (click here to see it in 2 colors). 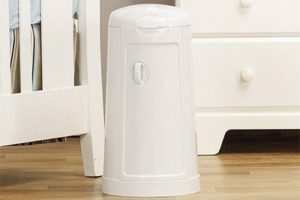 Like the name might suggest, it has a 360 degree swivel so you can point it any direction you want. It’s a nice-looking and small glider, so it will work in even the smallest of nurseries. You can easily switch it to any other room of the house when you’re done using it as a glider, too. It fits in well with other furniture. The only real downside of this glider is that it doesn’t have a high back. This means you can’t lay your head back to rest it. If you plan on sleeping in your glider, you might want to take a look at the other ones on the list, most of which both recline and have high backs. 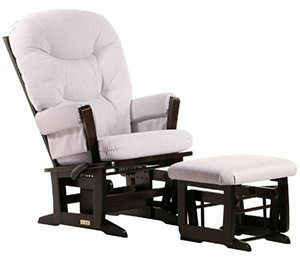 Do you have any questions or comments on glider chairs for nurseries? Do you have a personal favorite that’s not on the list? Let us know in the comments below!